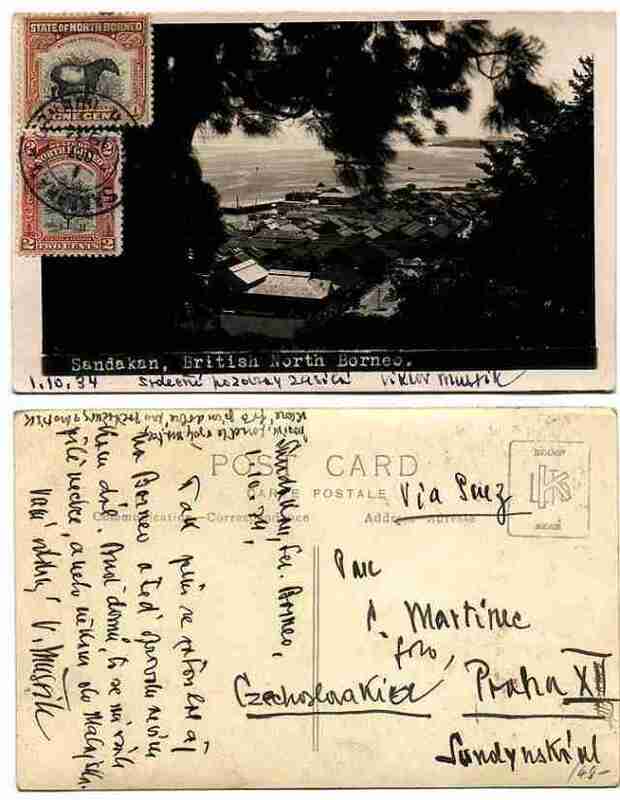 This picture postcard was mailed from Sandakan in the middle of the northeast coast of Borneo. In 1934, North Borneo was a British Protectorate and Sandakan was its capital. Sandakan is now in the state of Sabah, Malaysia. The single Sandakan CDS is the only postal marking on this card. The sender requested routing via Suez. via Panama or the United States but Suez was probably faster. The card is franked on the picture side with stamps from the 1925-28 pictorial series. a 2c. claret and black traveler's tree (SG 277 and 278). Although Sandakan appears to have been a pretty spot in 1934 it must have been isolated. Current views show it to be thriving.